After a cruise with more noise than what we were used to, it was so nice to dock in Miami and head over to our hotel in Miami/Kendall- Country Inns & Suites. The moment we walked in, we felt relaxed.From the relaxing decor in the entrance to the friendly,personal service, we didn't even want to go sightseeing today, and we didn't. 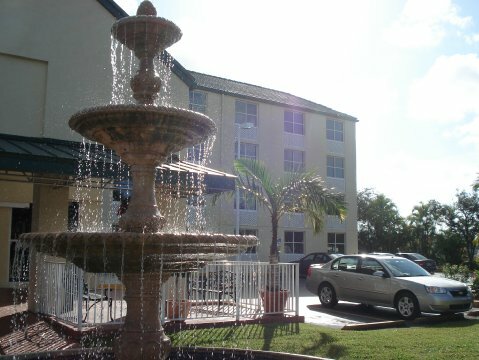 Country Inns & Suites Miami/Kendall is located in a quiet end of the city, yet near the Miami Zoo, Gold Coast Railroad,Everglades National Park,the Miami Seaquarium, colleges and universities. Each of their guest rooms and suites includes complimentary high-speed, wireless Internet access, a microwave, refrigerator, hair dryer, coffee maker and cable TV. Staying at a hotel with a complimentary buffet breakfast is also important to us.Convenient that we can eat right at the hotel and at no extra charge to us.As well, our room had a microwave and fridge.A great money saver as well.The Publix store is very close to this location and it was easy for us to pick up a few snacks and drinks and bring them back to the room. If not staying at this location however, Country Inns & Suites has locations across the country and available in many cities.By joining their Club Carlson as well, you can earn points towards future stays. A nice, quiet room for a good night's rest- quite what we needed today, with Country Inns & Suites delivering.